Why visit San Francisco ? San Francisco is located in the north of California, quite far from Los Angeles but in no way looks like the latter. Here there are no skyscrapers but Victorian houses; no long, flat streets but a city on a human scale with steep streets. It is the cradle of hippie, bobo or hipster movements, and the city is the pride of the gay community. It is also very cosmopolitan. San Francisco faces the ocean, looking out over the bay with its famous Golden Bridge. 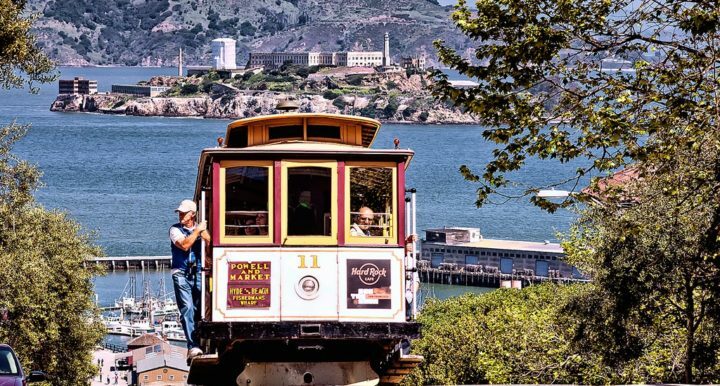 We say it is “the most beautiful city in the world” and we can consider thinking about it once there: take a cable car to walk the streets of “Frisco” and go for a walk in the different ethnic districts that make up the city center. Take a tour of the island where the former Alcatraz prison lies. In the evening, you will have no trouble finding a bar or club to party and mingle with locals. To help you to plan your trips in San Francisco, we listed visits and places of interests to do in San Francisco. Where to stay in San Francisco (appartments, hotels, youth hostels,...) ? To enjoy your stay in San Francisco, it is necessary to pick the right location to stay. We give you here our best tips to know in which neighborhood to sleep and choose your accomodation accordingly ! Want to see San Francisco as a local ? To discover hidden places and to enjoy your stay away from mass tourism? The fast lane is here !